That’s right the time has come for our very first GIVEAWAY! In this giveaway you’ll need to head over to our Facebook Page (https://www.facebook.com/PCSimplest) to be eligible to be entered into the giveaway. 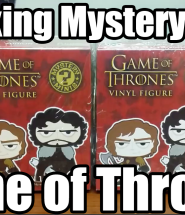 In this video we unbox two of the Game of Thrones Mystery Mini boxes. I really like the way that they have these packaged up and I was quite surprised as to which characters I got.